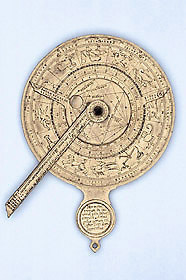 This instrument is remarkably close to an instrument by Caspar Vopel dated 1557, which is also in the collection of the Museum of the History of Science (Epact 97152). There are some differences, but the similarity extends to most of the detail. It has been suggested that the instrument by Schniep is a copy of that by Vopel, but both could, of course, have been copied from some other source.